Strength training exercises to tone and build muscle. Useful tips to get started with these exercises. 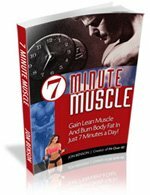 Includes three Levels of 7 Minute Muscle training for ultra-beginners, beginners, intermediate and advanced trainees. Plus special video bonuses. Train for strength in minutes! The stereotypical view of weight training is that it's a "guy's thing". Some guys even get intimidated by their more muscular friends. It becomes a bragging contest, I guess it's an ego thing. Forget that stereotype view because building lean muscle is the best way to start burning fat. It's not about building bulk. Use strength training exercises to build a base level of muscle which will naturally burn calories. This combination will quickly tone your body, as long as you also have a balanced diet. The other major benefit of weight training is that your muscles provide more support for your joints. This is a huge factor in avoiding common injuries. You are strengthening your skeletal system as well as your muscular system. Submit Your Strength Training Photos Here. Before you start strength training exercises, you need to know how muscle gets stronger. Well it's basically called overload. This is the idea that you need to work your muscle harder than it is normally used (pretty simple eh?). You can do cardio-free workouts using strength training exercises and interval training to burn fat and build muscle. Click here to try these Turbulence Training workouts. How do you achieve overload? Increase the weight you are lifting. Increase the reps (repetitions of lifting a weight) or sets (the number of times to repeat the reps with a short rest in-between i.e. 3 sets of 15 reps with 30 second rests between each set). These changes should be gradual and sensible to avoid injury. If you make an increase and then can't finish your sets, it shows you've jumped too much. You will see better results if you make smaller, gradual increases that your body can handle. On the other hand, if you've made in increase and still find the sets easy, then you haven't increased enough. Make a further increase and go from there. But make sure you can finish your sets with good technique and posture. Maximum lift.. this is important to determine the weights you start with, in your strength training exercises. Your maximum lift is the most weight you can lift in 1 rep. I recommend you have a friend spot you for this, even if you're using resistance machines, and definitely if you're using free weights. Pick a weight you know you can lift easily and increase it by 3-5kg each lift. This will help warm that specific muscle up, but won't fatigue it so much that it obscures your maximum lift. Keep increasing until you hit a weight you can't lift. The weight before that, is your maximum lift. These are all starting points. As explained above, you need to overload to progress. Part of this, is to check your maximum lift for each exercise every 2-4 weeks. As you progress, your maximum lift may increase with increased strength. You can then adjust your workout, according to your new maximum lift. These are good goals to set yourself. When you have achieved your goal, then the aim will be to remain at that level. You can build muscle and burn fat with Turbulence Training - Click here to find out how. As with any workout, warm up and cool down are always essential. You should never do strength training exercises with cold muscles. Always remember to cool down by stretching the specific muscles you used in your workout, to avoid walking like a robot for the next few days! Rest days are probably the most important part of your strength training exercises workout. During your lifts (overload), tiny fibres in your muscles "tear". It's during your rest days, that your body has the chance to repair these tears. This is the process that strengthens muscle, as each tear is repaired with many more muscle fibres. So I would recommend at least 1 day's rest between each workout. Depending on the intensity and load of your workout, you may increase your rest days to 2 or maybe even 3 days. Only you can tell when you are ready for your next workout. Listen to your body, if your muscles are still very sore, chances are that you won't be able to complete the workout and you'll risk injury if you do. Always keep good technique and posture. Using machines is great for developing this. Once you are used to machines then move on to free weights, there is much more variety of exercises with these. It's much harder to keep good technique with free weights, I recommend having a spotter, so you have that bit of extra confidence. Always keep your back straight and bend at your knees to lift or transport any (yes any!!) weight. I can't stress this enough to avoid serious back injuries. You may notice you can't lift as much weight when you first use free weights, as you can with machines. This is only natural because you are using extra muscles to keep balanced with free weights. Drop down a weight, develop your balance and technique, then you'll reap the rewards when you increase the weight again. You should spend some time on every part of your body. A huge upper body with skinny legs isn't a good look! Even worse, strong chest and abs with weak back muscles will lead to bad posture and maybe even injury. You should develop a pattern of breathing with each workout. Breathe out with each lift, and breathe in during the recovery phase, ready for the next lift. Click here for more advice on buying and using free weights. Wrist Curl (up and down).. sitting, hold barbell with your palms facing up, elbows resting on your thighs. Curl the weight upwards and hold for 2 seconds then lower. repeat with palms facing down. Shoulder Press.. sitting, hold each dumbbell at shoulder height, palms facing forward. Push arms up slowly then lower. Can be done standing, but make sure you have enough headroom. Bicep Curl.. standing, hold each dumbbell by your sides, palms facing forward. Lift by bending at the elbows which should be fixed by your sides, then lower. Tricep Extension.. sitting, hold one dumbbell in your right hand, lift arm and bend elbow, so that the dumbbell is behind your head. Straighten your elbow up, then slowly lower. Repeat with your left arm. Dumbbell Bench Press.. lying on the bench, both feet flat on the floor. Take the dumbbells and hold them just above your chest, making a straight line from one elbow to the other. Push up by straightening your elbows and slowly lower. Dumbbell Row.. kneel on the bench with left knee, right foot on floor, left hand leaning on the bench, keeping your back straight. Hold dumbbell in your right arm, palm facing in. Lift up to chest then lower. Repeat on your opposite side. Dumbbell Side Bends.. standing, hold a dumbbell by your side, palm facing in. Bend sideways without leaning forward or back. Reach down as far as you can, then slowly come back up to centre. Repeat on the other side and then with the opposite arm. Core exercises.. this is a good time to do some ab and back exercises. Dumbbell Squats.. standing with feet shoulder width apart, hold dumbbells by your sides, palms in. Keep your head and back straight, squat by bending at your knees so that they stay in line with your feet. Lower until your knees are at 90 degrees, then slowly raise. Calf Raises.. standing on the floor, raise your heels until all your weight is on the balls of your feet. Focus on balance and then slowly lower. Want ready-made strength workouts? Click here for WorkoutPass, which gives you access to over 40 websites filled with tested strength training workouts. will benefit your fitness greatly. I recommend mixing them in with some cardio exercise, such as cycling or swimming. You'll see the results much faster and be able to achieve your goals. If you've never used free weights before, then I suggest you go and get a practical demonstration by a fitness professional. Free weights do indeed give you freedom with your strength training exercises, but can injure if done incorrectly. have fun with strength training exercises. Add your pictures and tips for strength exercises. Your picture will have its own web page, credited to you, and linked directly from this page. Click here to see how your exercise pictures can be featured on this website. Submitting your pictures and tips is really easy. Please ensure it's specific to strength exercises (if you have another picture, go to the relevant page for that exercise). Time to show us what you've got.. enjoy! Click on the links below to see some great pictures and tips for your strength exercises. They were all submitted by other visitors to this page.. This is my first day of a new exercise program, watch my progress! Check out the exercise tips for Neil's dumbbell row . If regular push ups become too easy, this is a good way to test yourself... Check this video: Push ups with one medicine ball . fitness and weight loss information, tools and resources from her website and her new Toronto area studio. Go to The Exercise Directory from Strength Training Exercises. Return to Home from Strength Training Exercises.